I remember, as a child, spending hours in the garden with my mother. We would pull weeds, pick produce, plant seeds, water, and generally putter in the garden. It was nice, back then, spending that time with her and producing something that we could be proud of. Now that I am older and have a home of my own, I realize how much work a garden can be. We have a lot of garden, too; everything from hedges and shrubs, to empty planters and displays in the middle of the back yard. The property came like this, and while the ideas behind what it was supposed to look like are clear, the previous owner did nothing for weed control. I now spend a good portion of my free time pulling weeds and trying my best to prevent them from coming back again. I can’t imagine spending my entire summer with weeds up to my eyeballs. I’ve been doing a lot of research and a lot of the subsequent work to tame weed mountain. I can’t even tell you how many rolls of this stuff I have purchased. I have had to buy more than I need, because the first time around, I put the fabric down and waited far too long before looking at something to put on top of it. The weeds grew (albeit slowly and fewer of them) under the material. Landscaping fabric is almost plastic-like, and it blocks the sun from reaching the weeds, preventing them from sprouting and coming up. However, don’t make the rookie mistake that I made. The fabric won’t do it’s job for very long without something on top of it, and the more aggressive weeds will come up through the fabric. Once you’ve laid landscaping fabric down to block the weeds (and also prevent new seeds from hitting those areas), cover the fabric with bark mulch, wood chips, or decorative rock. This further blocks the sunlight from getting to the weeds and also provides a nice drainage for the plants that you actually want to keep in the garden. Rocks should be on the smaller side, otherwise too much light may filter in between them. Mulch is less expensive than rock, and can be just as aesthetically pleasing. 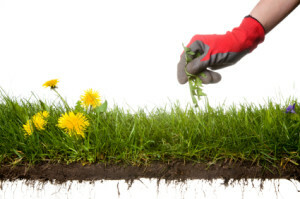 If your weeds aren’t so much an issue as they are a minor inconvenience, you may not want to go to the drastic measures I’ve suggested above to eliminate their ability to thrive in your garden. If one sprouts up occasionally, make sure to catch it when it’s young and pull the weed from the root. If you pull just the surface of the weed, it will grow back and may even spread seeds which create a larger weed problem. Mature weeds are more difficult to remove in their entirety, as they usually have much more complex root systems, and the root can be strong and stubborn (that’s why they call them weeds!). Catching the weed when it’s young can nip the problem in the bud quite easily. No matter what you do, dispose of the weeds that you get rid of in a container that has an airtight lid, so that the weed doesn’t let off seeds which will take over your garden again when the wind has the chance to blow them around. These things may seem quite simple, but they are effective and will make your life a lot less challenging when the weeds start to sprout up each year. How do you control weeds in your garden? Oh Daisy, I am a horrible gardener. I don’t even try, but I am so excited to hear that just pulling them from the root will get many of them. There are so many in our patio, and one has even grown into the size of a small tree. I have to take a small saw and hack it down every so often, so it doesn’t grow through our wooden overhang. Oh boy, what a disaster! Landscaping fabric has worked the best for me. I have this birds of paradise plant actually that gives me more trouble then weeds. It grew through the mulch. Im going to try some weed killer on this thing as its just driving me nuts. Usually I dig the weeds up as most of them are growing around my the edges of the plants. i don’t have a garden at the moment.